How Will 2016 Tax Fraud Laws Affect You? Even the Internal Revenue Service occasionally makes mistakes. The IRS sent out more than 13,000 refunds totaling about $27 million in 2013 — to individuals who may have had no right to receive them. The returns had been flagged as potentially fraudulent, but they went out anyway thanks to an IRS computer glitch. Passing new tax legislation can’t ensure that important computers won’t suffer hiccups, but it can address the possibility of fraud. The Protecting Americans from Tax Hikes Act was passed and enacted in December 2015 and began affecting filers in 2016. The federal government launched the Security Summit Initiative shortly after that. It also took effect during the 2016 filing season. How will these new legal measures affect you? Probably not profoundly as long as you don’t try to get money from the IRS that you’re not entitled to. The laws' trickle-down effects may require a bit of your patience, however. The Protecting Americans from Tax Hikes Act, commonly called the PATH Act, takes its name from the idea that fraudulent claims for refunds result in higher taxes for everyone. The government raises taxes to try to recoup the money it lost. One of the PATH Act's provisions is to delay two refundable tax credits. The Earned Income Tax Credit and the Additional Child Tax Credit can’t be paid out until the IRS has had ample time to make sure that the taxpayers claiming them are entitled to them. The EITC, in particular, is designed to put cash back into the pockets of lower income families, so this delay might be a bit painful, but it's really not very long. Beginning in 2016, the IRS has been prohibited from sending out refunds to any taxpayer who has claimed either of these credits until after February 15. So if you promptly file your return and you're anticipating a nice refund based on claiming one or both of these credits, you’ll have to wait a little longer than some other taxpayers. You may also hear from the IRS as it attempts to ensure that you are who you say you are and to verify that you are indeed entitled to claim your dependents. Both the EITC and the ACTC increase with the number of dependents you can claim. The good news is that the PATH Act won’t decrease your refund provided that you’re entitled to claim it. The bad news is that your entire refund will be delayed until after this date, not just the portion resulting from these tax credits. If you’re expecting a $3,000 refund and $2,000 is the result of one of these refundable credits while $1,000 represents money you overpaid through withholding, the IRS can’t send you the $1,000 then give you the $2,000 later. It must retain the entire $3,000 until February 15 comes and goes. Taxpayers who do not have a Social Security number, such as resident and nonresident aliens, must apply to the IRS for Individual Taxpayer Identification Numbers so they can file their tax returns. As of January 1, 2017, the PATH Act requires that a taxpayer with an ITIN must have used it to file a return within the last three years. Otherwise, it becomes invalid. The taxpayer must then take steps to renew his ITIN with the IRS before he can file a return. Additionally, all ITINs that were issued before 2013 will expire in 2017, so those taxpayers must renew their numbers, too. ITIN documentation requirements for individuals and children who can be claimed as their dependents have been tightened up as well. 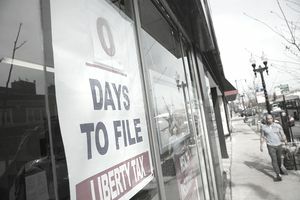 Returns filed with expired ITINs — either the taxpayer’s or his dependents’ — will result in delayed refunds and may even make the taxpayer ineligible for some tax credits. You can renew your ITIN by filing Form W-7, the Application for IRS Individual Taxpayer Identification Number, with the IRS. It comes with instructions. Some documentation is required. The Security Summit Initiative addresses tax-related identity theft. It’s a partnership launched by the IRS along with state taxing authorities and tax professionals — including companies like TurboTax and H&R Block who offer software and programs. Its provisions first took effect during the 2016 filing season. They're designed to protect taxpayers from identity thieves who might try to file tax returns under their names using their Social Security numbers or ITINs. So what does this initiative mean to you? Probably just a little extra aggravation at tax time. If you use tax preparation software, there are new rules for passwords. You’ll have to jump through a few more hoops to confirm your identity each time you log in, including setting up security questions and email verification. New lock-out features have been implemented, so if you repeatedly enter erroneous information when you try to log in, you’ll eventually be barred from access until you can get the situation straightened out. Just call the software provider for assistance. If you’ve already been a victim of tax-related identity theft, the IRS will issue you an Identity Protection PIN, called an IP PIN. The number must now be changed each year and your dependents must each have one as well. Beginning with the 2016 tax year, everyone who has IP PINs must include their numbers on their tax returns. Finally, approximately 1.2 million W-2 forms will bear a new 16-digit verification code in 2017 as the IRS rolls out another fraud-prevention tactic as part of the Security Summit Initiative. But you won’t have to do anything with this as a taxpayer. It simply helps the IRS monitor information returns that are filed electronically by employers and financial institutions. Some states have also stepped up their filing requirements under the terms of the Security Summit Initiative. For example, you may have to provide a copy of your driver’s license or other state-issued ID when you file your return. Check your state’s website before you attempt to find out if your state is one of them and, if so, what’s changed. These legislative changes will mostly result in refund delays and some extra steps at tax time, at least for most taxpayers. So take a deep breath and grin and bear it. Remind yourself that they’re all designed to protect you.